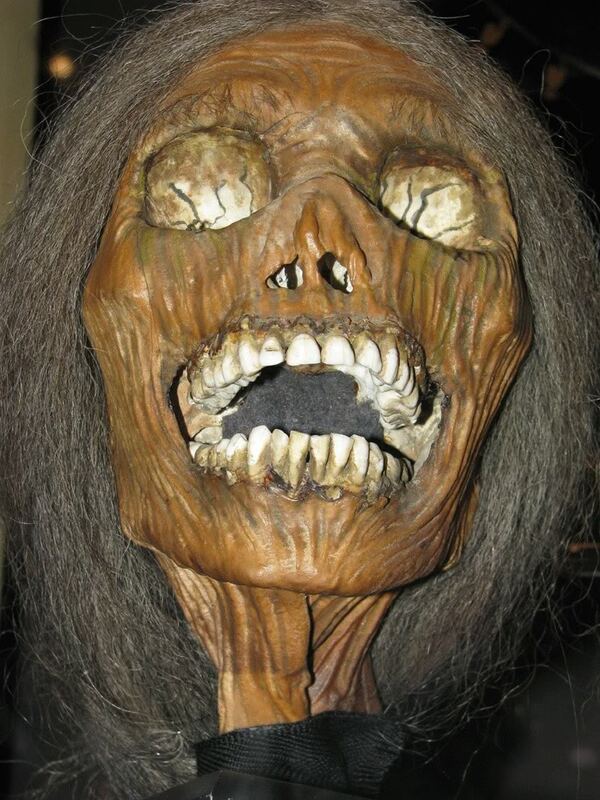 ‘For one particular Alfred Hitchock thriller, the script called for Janet Leigh’s character, Marion Crane, to drive up a long and lonely road on a dark, rainy night, and search for a place to stay. 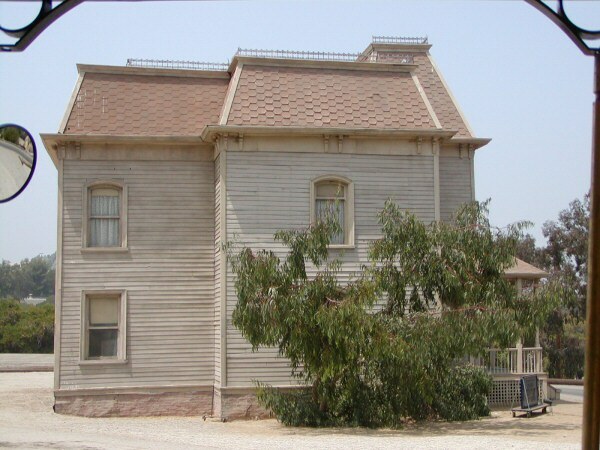 As you approach the front steps of the house and take a close-up look you will be struck by the fact that, unlike many of the one-sided sets or facades on the Backlot, the Psycho house actually has four sides and a roof. 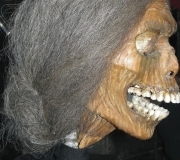 And, if you look really carefully, you may still be able to spot Norman’s mother peering out of the upstairs bedroom window, still rocking in her chair. 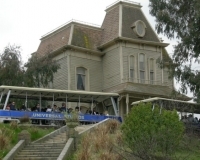 The Psycho house was one of the big draws of the Universal Tram Tour back in 1964, and continues to be the subject of much interest even now. Over the years the house has been through a number of alterations and has even completely moved location twice after construction. 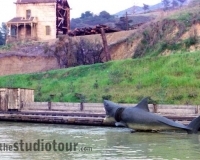 ‘Why is it on Universal’s lot? 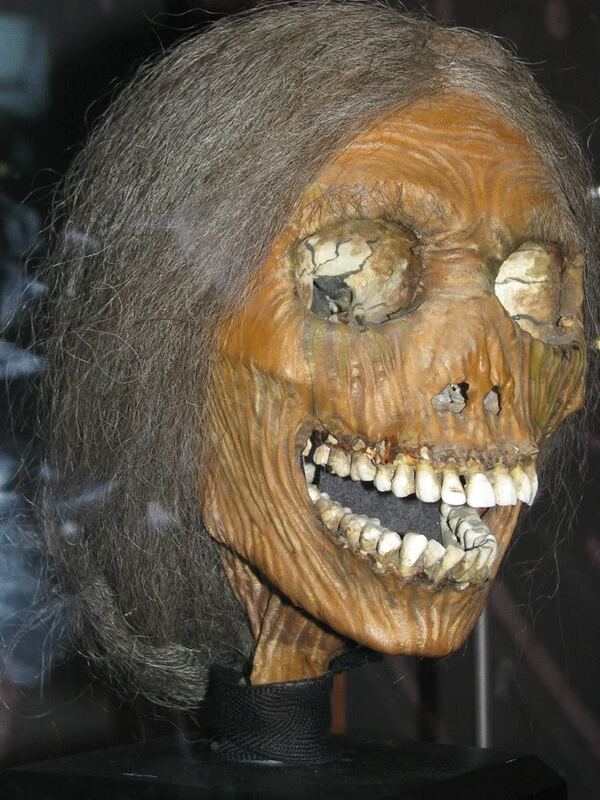 Isn’t Psycho a Paramount film? Psycho was the last film Alfred Hitchcock made for Paramount. 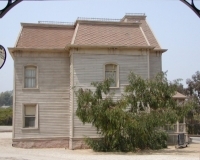 By the time principal photography started, Hitchcock had moved his offices to the Universal lot and that was where the film was shot. 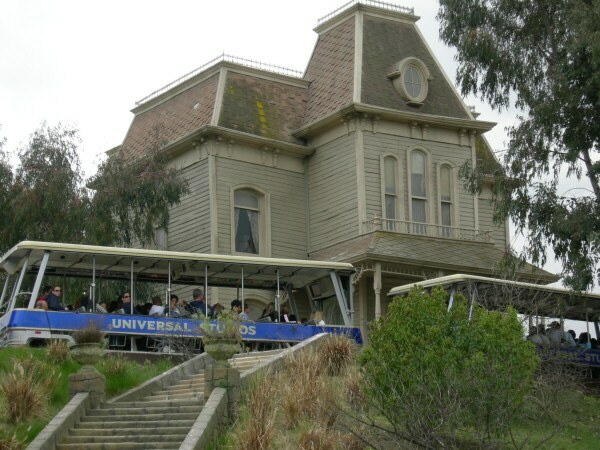 Design: The Psycho house was built from a number of Universal’s stock units to save money. 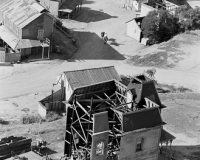 The front of the house and the distinctive tower was the same as that used in the “Harvey” house on Colonial Street. Originally it consisted of just the left wall and the front of the house. 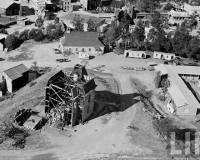 In 1963 (photos below), the other side wall was added, and then in 1983, the rear of the house was added. 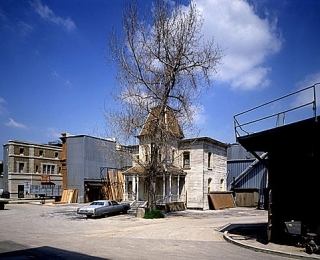 The house set has been moved three times since it was originally built. 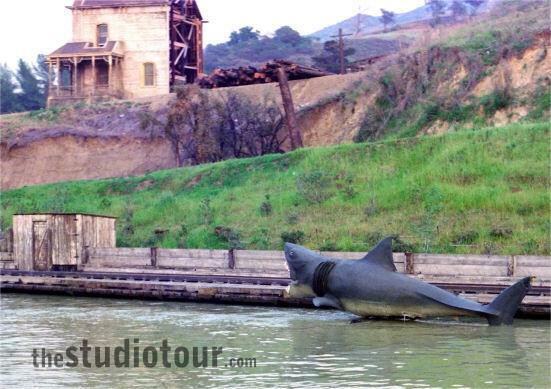 The house appeared as above, on the hill above Singapore Lake (now the home of the Jaws attraction). 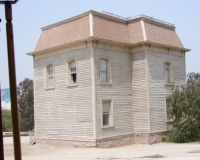 Until 1963, the house consisted only of two sides. 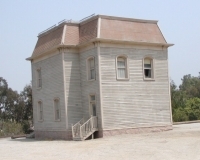 In 1963, the other side of the house was added for it’s appearance in Invitation of a Gunfighter – originally the house was a shell with just two sides (front and left side) as that was all that was seen in the movie. 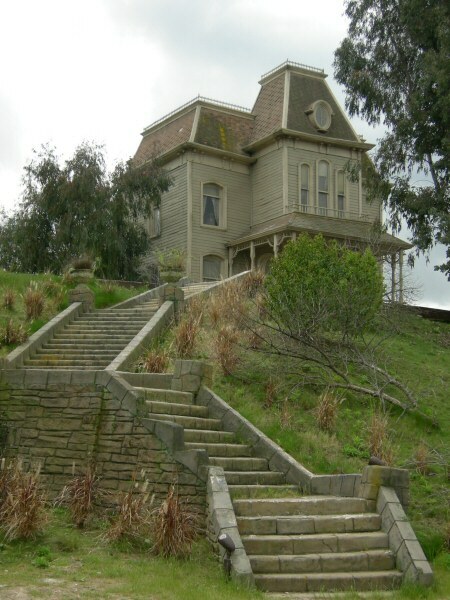 The Psycho house was one of the main attractions of the early days of the tour. 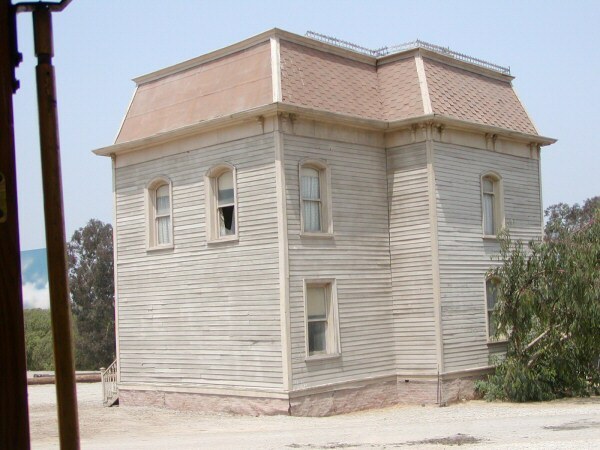 In December 1980, the Psycho House set was seen being dismantled. It next appeared painted pink in the 1981 Chevy Chase comedy ‘Modern Problems’ where the house appeared to have been transported to the beach. 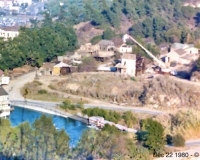 During 1981 major earthworks were in progress on the backlot to level the hill tops to create CityWalk and the new Upper Lot, along with the new Colonial Street and Falls Lake locations. 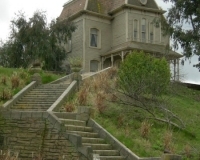 In 1982 the Psycho House appeared in ‘Coming Soon’ with Jamie Lee Curtis, directed by John Landis, looking back at 50 years of Universal horror movies. 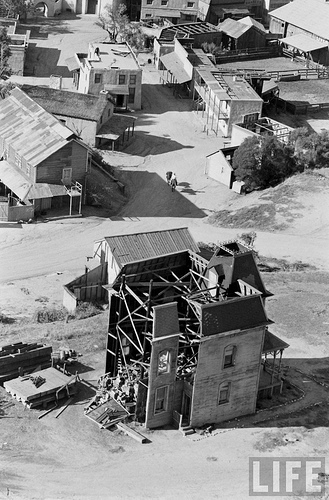 The house set appeared to be setup outside the Studio Mill building (above). 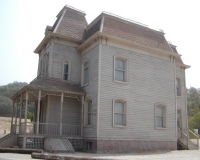 Location #2: 1982 – ?1986 – The house was moved to a more remote location in the pre-production period for Psycho II (1983). The area by Singapore Lake / Jaws Lake then became the site for The Chicken Ranch when it was moved onto the backlot following production of The Best Little Whorehouse in Texas (1982). 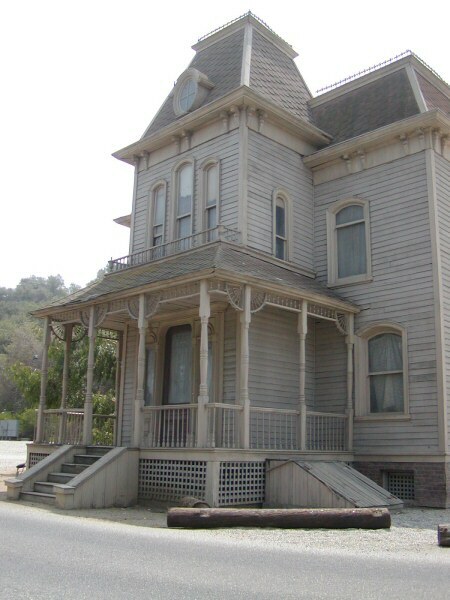 The reconstructed Psycho House set had a back section added, and around 30 feet of the Bates Motel was built for the movie. 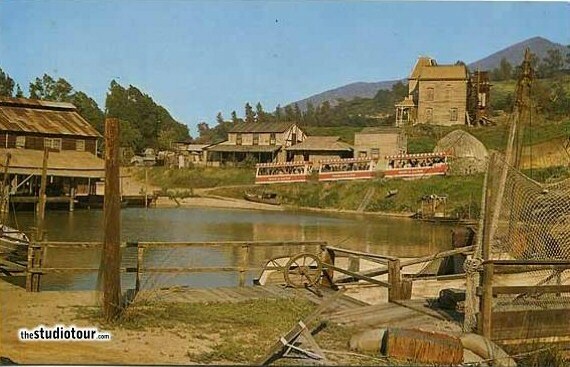 The rest of the motel (and the area beyond it) was done as a matte painting. 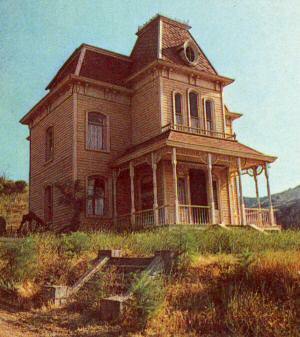 The new Psycho House location was on a plateau at the south end of Falls Lake (before the log cabin was built). 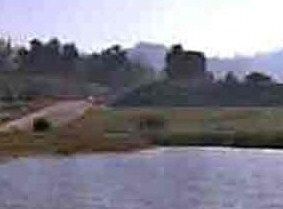 The photo above is from the Halloween Knight episode of Knight Rider (1984) and shows a hazy Psycho House at the end of Falls Lake. 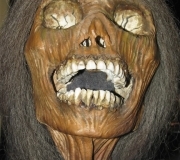 Location #3: ?1986 – present – Adjacent to Old Falls Lake (where the swamp scenes were filmed in the original movie) the house and motel have been recently restored. 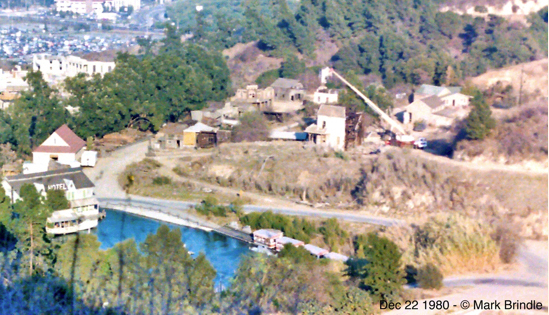 The house was in this position in 1986 when the Falls Lake backdrop was being built, and it’s likely it was moved when this construction work started. 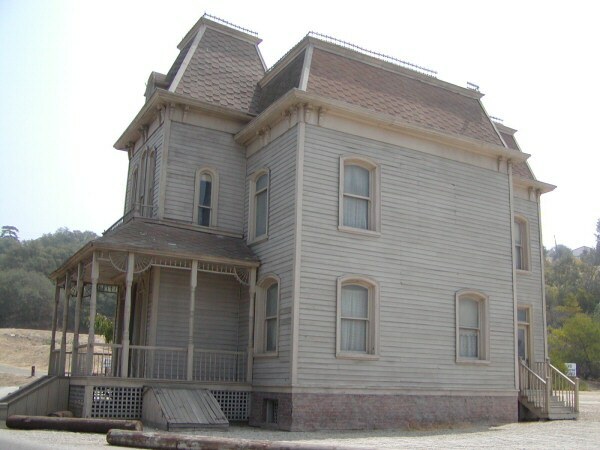 The interiors for the Psycho House (for the original Psycho movie) were shot on Stage 28 at Universal. 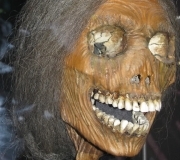 A well-known actor while shooting a big movie on the Universal lot back in 1999 dressed up as “mother” and leapt out from behind the Psycho house with an axe scaring the bejeesus out of everyone on the tram, including the guides. 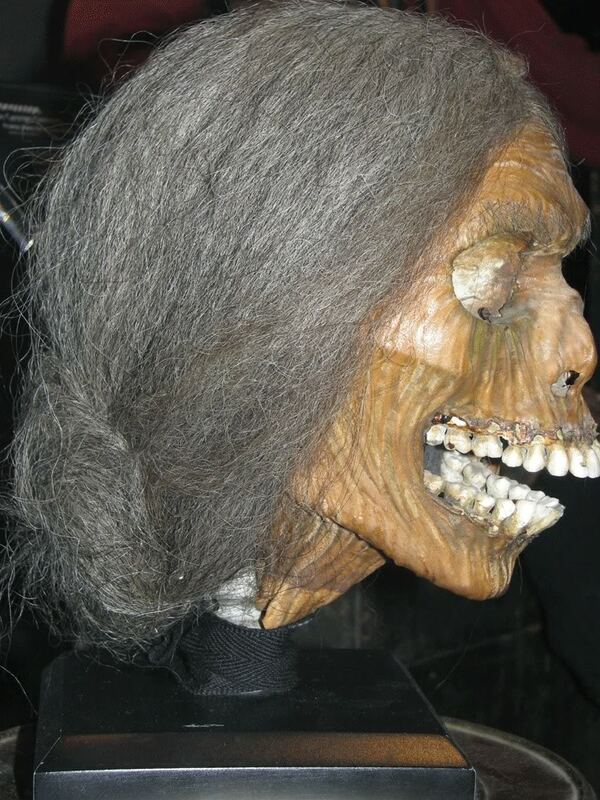 The movie was Man on the Moon and the actor was Jim Carrey. Tram operators spoke to the film crew for an explanation and they said he was just trying to channel the creative energy of Andy Kaufman (the comedian he played in that movie). 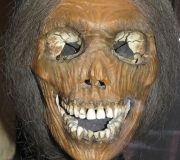 He wanted to repeat the stunt some years later in full Grinch make-up but the studio publicity department refused as the make-up was being kept under wraps until nearer the release date. He finally succeeded in repeating the stunt (albeit in a more rehearsed way) on the Conan O’Brien show in 2009. 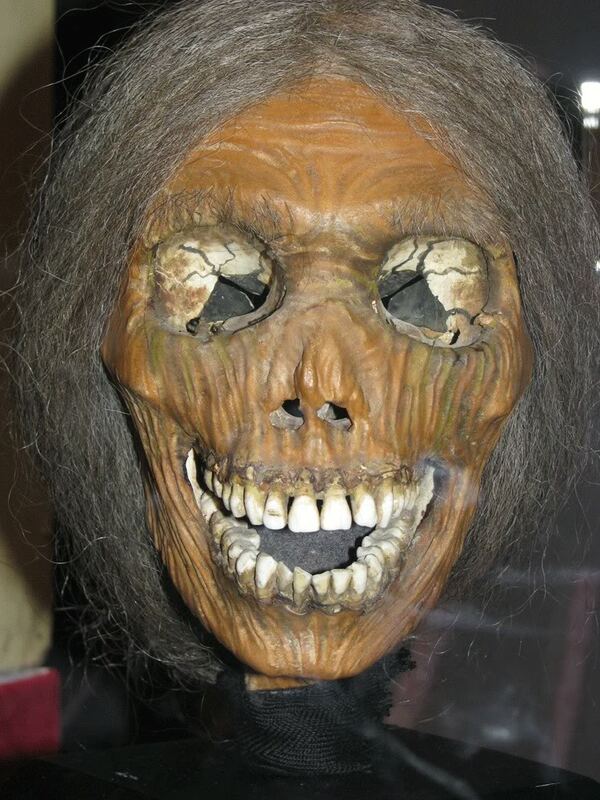 The prop head made for Psycho was given to the Cinemathique Francaise museum in Paris by Hitchcock in 1961. It can be seen there to this day. Thanks to UniversalDreamer for the information and the following photos. 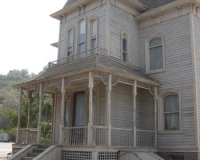 As well as it’s debut appearance in Hitchcock’s Psycho in 1960, the house has appeared in many other movies. 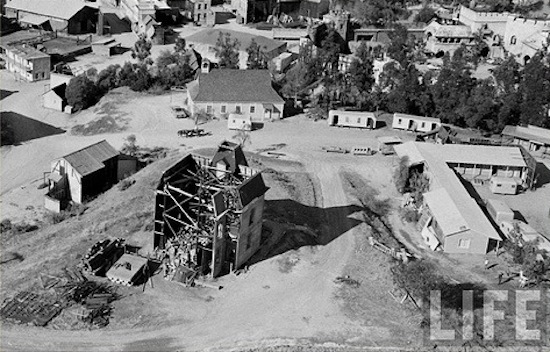 Colonial Street (Munster House and Harvey House), Psycho House on the backlot is featured in the main titles. 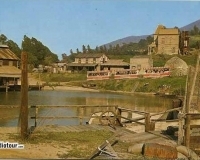 Black Lagoon (dumping of the body), Courthouse Square (as Fairvale), Psycho House on the Universal backlot.